Natural Allergy Symptom Relief - All About Health, Inc. The Body has adverse reactions to foreign substances more often when it is acidic. In addition to using the essential oils as listed here to relieve allergy symptoms, it is very important that you increase your water intake and reduce (or eliminate) mucus-forming foods such as dairy, sugar, bread, and meat. I personally had allergies for years until I reduced and eliminated these things from my diet. I am now allergy-FREE (and have been for years) and I'm LOVING every minute of it! I have learned that it is NOT worth eating certain things that make my body react to this time of year. Eliminate dairy, sugar, bread, and meat! Apply specifically on the signals of the area affected. For example, if allergies affect the eyes, apply on the eye signals; if allergies affect the sinuses, put on the sinus signals. 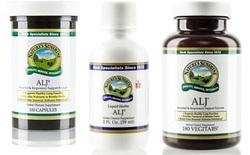 ﻿ALJ is a Nature's Sunshine product that we recommend for relief of allergy symptoms. It is available in capsules, vegitabs, and liquid. The statements on this website have not been evaluated by the Food and Drug Administration. Information on this website is not intended to diagnose, treat, cure, or prevent any disease. Click here to read full disclaimer.